© Photos by Margarida Correia. See captions at bottom of post. Though bad weather destroyed most of their heirloom tomatoes, Eckerton Hill Farm still drew significant crowds to its stand at the Union Square Greenmarket on Saturday. The Pennsylvania-based farm had plenty of hot peppers — its second most popular crop — to compensate for the missing tomatoes, and an unusual seasonal show stopper: the jelly melon cucumber. The oval-shaped cucumbers with protruding horn-like spines caught everyone’s attention. © Photo by Margarida Correia. Black radishes on sale for $2 a pound at the Union Square Greenmarket in New York City. A black radish? Who knew? The winter version of the more familiar red radish — which grows in spring and summer — is available at Paffenroth Gardens at the Union Square Greenmarket for $2 a pound. The black radishes are round and beautiful, but think twice about eating them raw with a little salt, as the farm suggests. They don’t make for a tasty treat – no matter how much salt you use. It might be better to grate them and add them to soups and stews. Radishes, according to Wikipedia, are rich in ascorbic acid, folic acid, and potassium. And they’re a good source of vitamin B6, riboflavin, magnesium, copper and calcium. For more “Freaky Fruit” – the unusual bounty spotted at Greenmarkets throughout the city – click here, here and here. © Photo by Margarida Correia. 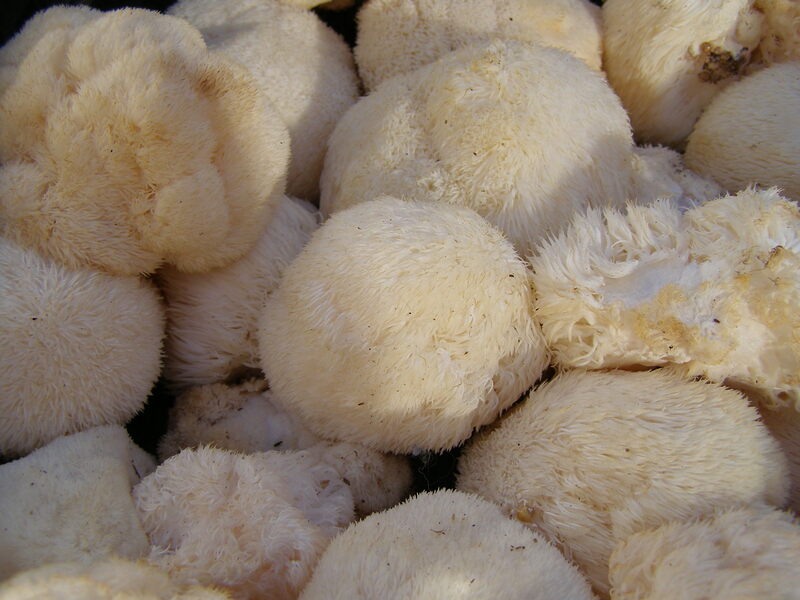 Pom pom mushrooms on sale for $12 a half a pound at the Union Square Greenmarket in New York City. They looked more like the paws of the polar bear at the Central Park Zoo than they did like mushrooms. The seeming white pods of fur — called pom pom mushrooms — were going for $12 a half a pound at the John Madura Farm stand at the Union Square Greenmarket. The unusual mushrooms are pricey but are said to taste like lobster or crab. 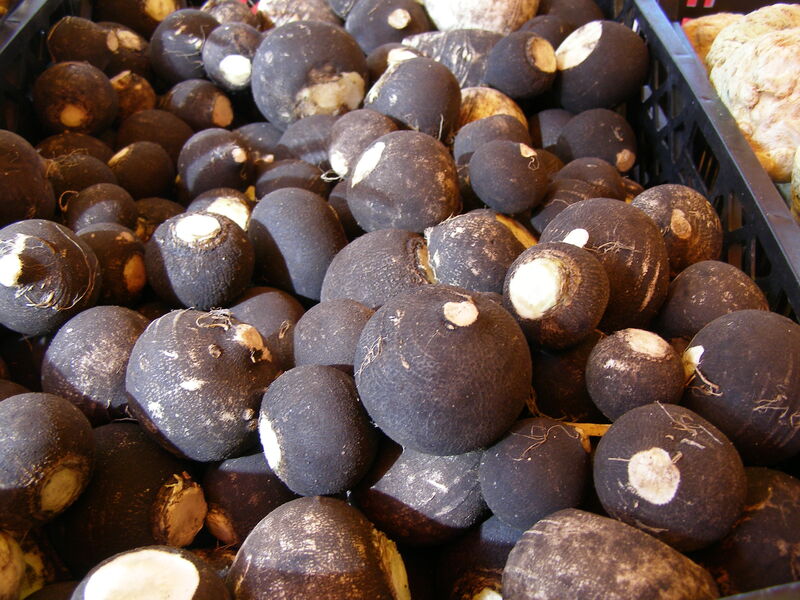 According to the sign at the farm stand, pom pom mushrooms can be sautéed and are great as a garnish or appetizer. They are often used in Chinese cuisine and even more so in Chinese medicine. Chinese healers use the mushrooms to help treat ailments of the stomach and digestive tract, improve liver function and refresh the breath, among other things. Pom pom mushrooms go by many other colorful common names, including lion’s mane mushrooms, bearded tooth mushrooms and hedgehog mushrooms. Here’s a new name to throw into the ring: how about bear paw mushrooms? For more Freaky Fruit – the unusual bounty spotted at Greenmarkets throughout the city – click here, here and here. © Photo by Margarida Correia. 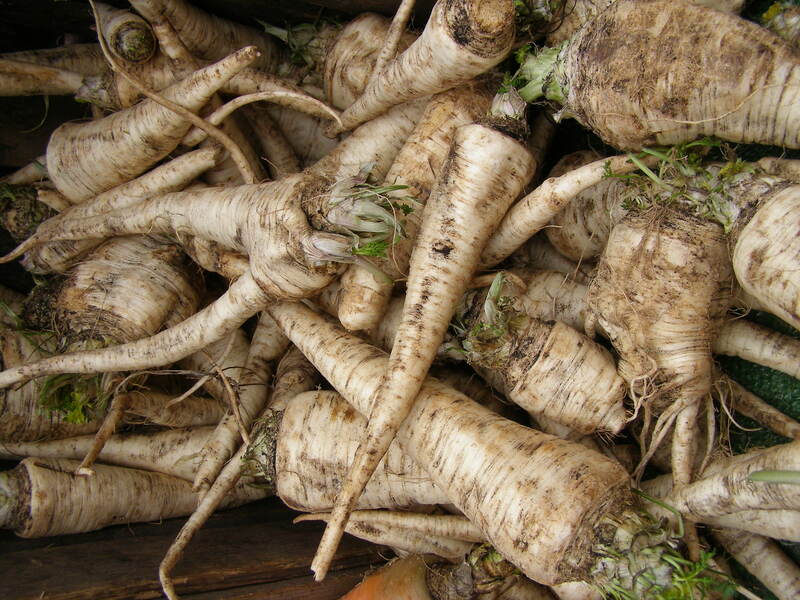 Parsley root is a hearty vegetable that can be used interchangeably with carrots, turnips, parsnips and celeriac in soups, stews and other dishes. It was going for $1.75 a pound at the Union Square Greenmarket. There’s nothing unusual about everyday, run-of-the-mill parsley, unless it happens to be its strange, downright freaky relative: Hamburg parsley. This type of parsley has a shockingly enormous root that passes easily for a parsnip. Parsley root — as it is known more simply — is a hearty vegetable that can be used interchangeably with carrots, turnips, parsnips and celeriac in soups, stews and other dishes. It can also be served fresh, fried, sautéed and baked. The savory root vegetable — which was going recently at the Union Square Greenmarket for $1.75 a pound — is said to taste like a mix of celery, turnips and parsley topped off with a slightly nutty flavor. It is widely used in central and Eastern European cuisines in soups and meat and vegetable stews and casseroles. Parsley root goes by a variety of other names, including turnip-rooted parsley, Dutch parsley, Rock parsley, Rock Selinen and Heimischer. Here are recipes, recipes, recipes for parsley root and other root vegetables. For other seasonal “Freaky Rruit,” click here and here. ©Margarida Correia. “Wildman Steve Brill,” founder of a wild food foraging business, leads wild food and ecology tours in New York City public parks. 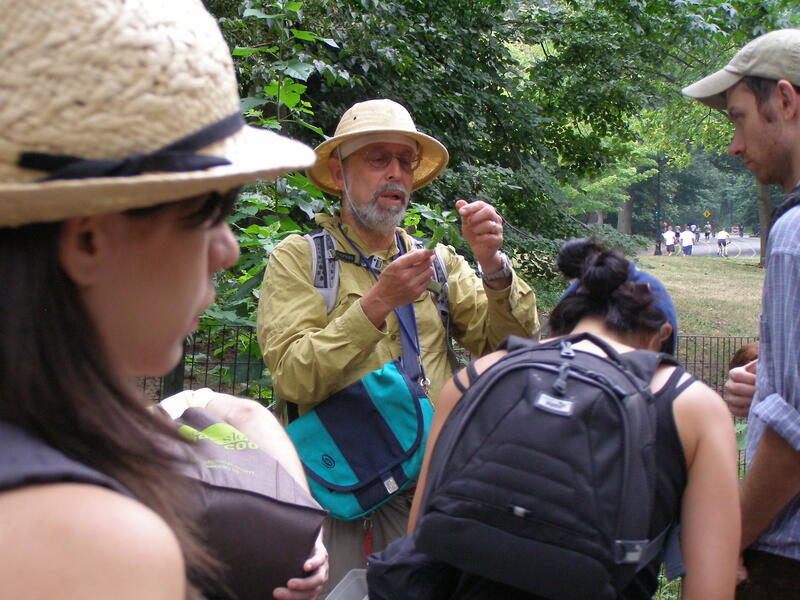 His tour on Aug. 1 in Prospect Park, Brooklyn, drew 39 foragers. A brood of 39 foragers following Brill on his four-hour tour of Prospect Park in Brooklyn descended on the tree, picking and eating the cherries or harvesting them into plastic containers. It was the first of many wild black cherry trees the young urbanites would see. The foragers were half-way into the tour and had already had their fill of lambsquarters (that’s wild spinach) and other edible leafy greens. Many carried plastic bags bulging with leaves, roots, seeds, stalks and stems of a riotous assortment of wild edible and medicinal plants. Call them extreme locavores. While most local food enthusiasts are happy to buy fruits and vegetables from farmers markets and local vendors, a fringe group is taking its commitment to a new level — they’re foraging in local parks and other public places. Over the last three to five years, Brill has experienced an uptick in number of tour participants, leading about 40 people on average. On Labor Day last year, he hosted a record 78 foragers and nature enthusiasts in Central Park. “Except for this summer, it’s been increasing,” he wrote of tour participation in an e-mail message. Wildrafting.net, a website for foragers, has more than 5,000 members, mostly in the U.S. and Canada. And ForageAhead, a nine-year Yahoo! e-mail group that discusses wild edible plants, animals and mushrooms, has almost 2,100 members globally. Brill — who markets himself as “Wildman Steve Brill” and “America’s Best-Known Forager” — runs his weekend tours almost year-round, from the first weekend in March to the first in December. He’s been leading tours in New York City and the surrounding area for more than 25 years. Brill says it’s relatively easy to forage enough food in public parks for a family-sized group, if people go to enough locations. Foragers can find wild foods throughout most of the year. “The best time for roots is early spring and fall. For fruits and berries, it’s from late spring to fall. For nuts, it’s fall,” Brill wrote in an e-mail. Leafy greens are best early through mid-spring, and mushrooms are at their peak late summer and fall, after days of torrential rain. On Brill’s tour in Prospect Park in early August, several herbs and vegetables grew in abundance. In addition to lambsquarters, which grew everywhere, there was amaranth and to a lesser extent wood sorrel. Brill led the group to a large, shady patch of Asiatic dayflower, a plant with supple leaves that the foragers gently pulled from their stems and stuffed into supermarket-size plastic bags. “There’s no greater vegetable to put in soups,” Brill said of Asiatic dayflower. Though challenging, even restaurants can forage enough food for some of their menu items. “There are some seasonal plants that can be harvested in large quantity,” Brill said in an e-mail message, listing garlic, mulberries, purslane, wild carrots, dandelions, and beach plums as some of the things off the top of his head. Wild food is far more likely, however, to be served in restaurants in less populous places. In Finland, for example, foraged berries and mushrooms are a mainstay in most restaurants. Finnish restaurateurs also serve wild game like moose and bear, according to Henriette Kress, a member of the ForageAhead online discussion forum. As rare as foraged food is in New York eateries, Brill sometimes lead tours for the staff of some of the city’s best-known restaurants. He’s worked with Pure Food and Wine, Blue Hill Restaurant, and most recently Club 21. Still, it’s curious New Yorkers who Brill is banking on – the ones looking to feast on wild black cherries and other truly natural snacks. © Margarida Correia. 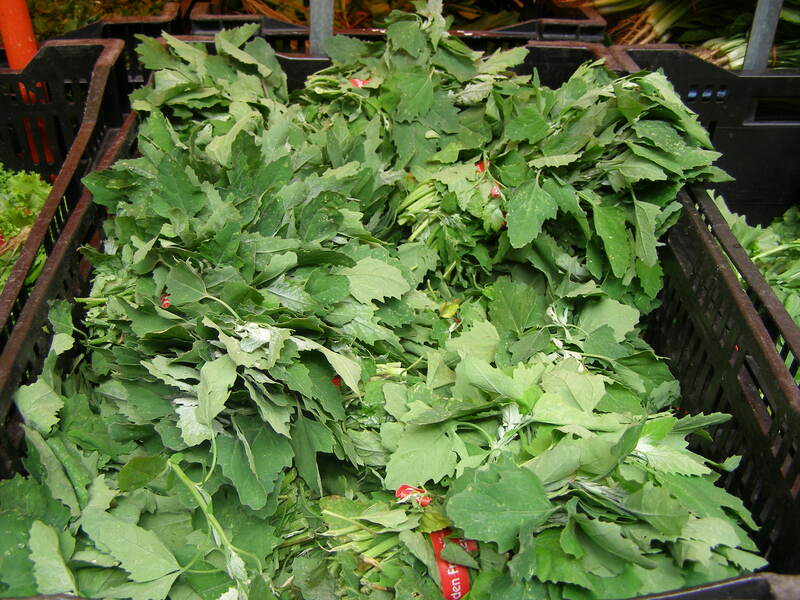 Lambsquarters at the Union Square Greenmarket in New York City. It’s been quiet on the freaky fruit front. But now, as the new season kicks in, unusual greens are beginning to debut at the farmers market. Here’s a strange one: lambsquarters. Lambsquarters is an elaborate name for wild spinach. The edible weed is also known as goosefoot and pigweed. With serrated leaves, lambsquarter is more reminiscent of parsley than it is of its curly, rambunctious cousin, common spinach. Lambsquarter has three times the calcium of regular spinach and is a better source of iron than spinach because it lacks oxalic acid, which blocks iron absorption. Lambsquarter can be cooked or eaten raw, just like spinach. It sells for $2.00 a bunch at the farmers market. Click here, here and here and for more Freaky Fruit. © Margarida Correia. Romanesco broccoli at the Greenmarket at Union Square. Hey all you freaky fruitistas: We’ve hit the peak of the freaky fruit season. Things like celeriac, osage oranges and husk cherries are out in force at the farmers market. 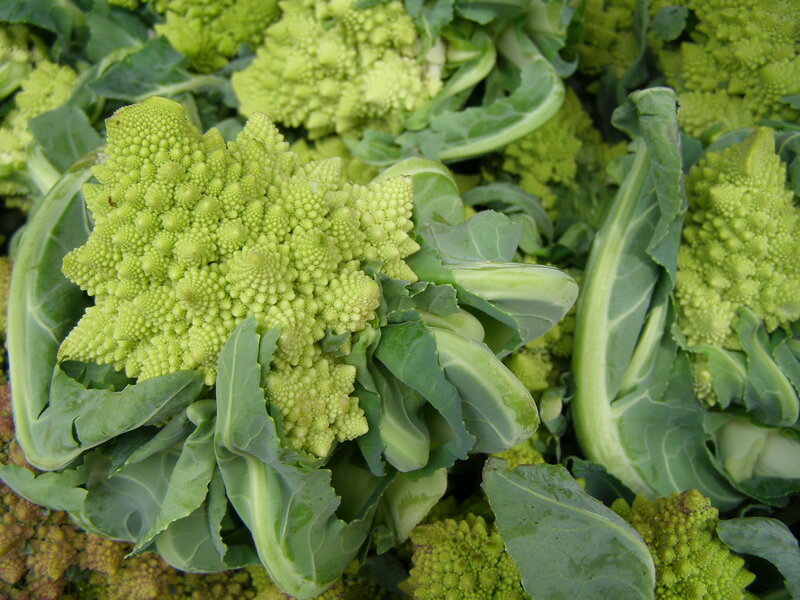 Here’s another oddity to add to the season’s crop of unusual vegetables: Romanesco broccoli. The vegetable – a variant of cauliflower – looks like coral. It’s not exactly the type of thing you’d want to eat at first glance. But farmers say it’s less bitter than broccoli and tastes great when steamed or sautéed. Plus it’s rich in vitamin C, fiber and carotenoids. Why not give it a try? The vegetable is going for about $2.25 a pound at the farmers market. Click here for more freaky fruit.